Bananas Foster is a New Orleans-inspired dessert where bananas are quickly cooked in a caramel rum sauce, and topped with vanilla ice cream. Just 10 minutes gets you the perfect, date night dessert. It’s the secret weapon of any bachelor…or bachelorette! Why is it called Bananas Foster? The story goes during the 1950’s in New Orleans, Brennan’s restaurant owner, Owen Brennan, tasked his Chef, Paul Blange, to create a dessert using bananas, a locally imported commodity. Thanks Chef! Bananas Foster is one of the most romantic comfort foods of the dessert world! How do you make Bananas Foster? 1. Melt brown sugar and butter in a cast iron skillet on medium heat. 2. Add vanilla, pecans, and cinnamon; heat and stir until combined. 3. Lay sliced bananas in the caramel sauce and heat long enough to soften. 4. Turn off the flame; add alcohol and ignite the sauce with a match. This is the flambe part, so be careful! 5. Allow the flame to subside, top with ice cream, and devour! Flambé is an open flame in a skillet which burns off alcohol. This means ALL precautions MUST be taken to avoid injury and prevent fire. As with any cooking activity, your fire extinguisher should be readily accessible. That said, the magic that occurs from this lucious, skillet-dessert flambé is a rich, rum or bourbon flavored, buttery caramel sauce. Can you make Bananas Foster ahead of time? You could make the caramel sauce ahead of time and store it in the refrigerator until needed. However, unless you’re catering an event, I find it just as easy to make the sauce as needed because it comes together in a snap. You definitely would not want to make the entire Bananas Foster recipe ahead of time because the bananas will not hold up in the storage process after cooking. Great question, right? Since bananas foster is cooked so quickly, the alcohol will likely NOT burn off in the same way it does, say, in a simmer sauce. So, in essence, Bananas Foster probably should be considered an alcoholic dessert if you’re toeing the line. What can you substitute for rum in Bananas Foster? Hmmmm, my thinking is…if you substitute anything for the rum or liqueur in a Bananas Foster recipe, you’re making Not Bananas Foster. There is nothing like the flavor of a lightly cooked rum with butter and brown sugar. But, if you’re unable to consume alcohol, I’ve heard you can use apple juice or pineapple juice in place of the alcohol. Yeah, it won’t be much like a traditional Bananas Foster recipe, but I bet it’ll still be good. What are the ingredients for Bananas Foster? 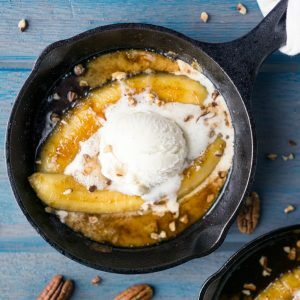 Bananas Foster recipe served in a skillet? One of my favorite things about this recipe, besides everything, is that it’s served in that cute 5″ cast iron skillet, which makes it perfect for one. 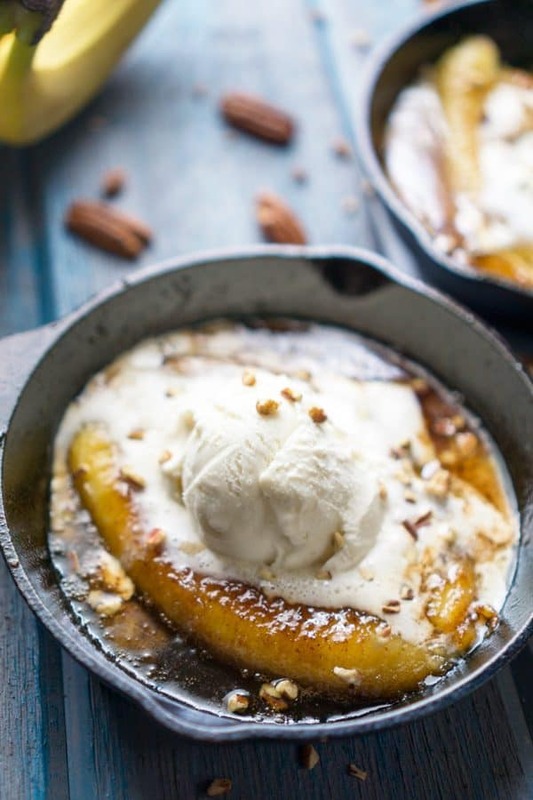 You can serve Bananas Foster in any dish other than a skillet, I just have a soft spot for skillet desserts. No matter how you present it, you get to control the serving portions, so you’ll never be stuck with too much dessert. We all know what happens when you make too much dessert! Have I mentioned how easy Bananas Foster is to make? It takes 10 minutes…10 minutes guys! Grab that recipe below! If you’ve never made it, and you have someone to impress, even if that person is YOU, give it a go! Do you love easy dessert recipes? Me too! Bananas Foster is a New Orleans-inspired dessert where bananas are quickly cooked in a caramel rum sauce, and topped with vanilla ice cream. Just 10 minutes gets you the perfect, date night dessert. It's the secret weapon of any bachelor...or bachelorette! Melt BUTTER in iron skillet over medium heat; add BROWN SUGAR; stir until dissolved (about 2 min). Gently stir in VANILLA, PECANS, and CINNAMON. Place BANANAS, sliced side up, in sauce; heat for about two minutes. Gently turn bananas over, sliced side down; heat about two more minutes. At this point, you can serve it as a non-alcohol dessert with a scoop of ice cream, OR continue to flambé (with alcohol). Turn OFF flame under skillet; add RUM and BANANA LIQUEUR to the skillet sauce. Using a long, lit match or long lighter, and keeping your body and any clothing away from the skillet, carefully draw the flame close to the sauce surface; it will briefly ignite, so quickly move your hand away from the flame to avoid injury; allow the flame to naturally subside (within a few seconds). Serve warm with a scoop of VANILLA BEAN ICE CREAM and a few chopped pecans. This is such a unique recipe. Cant wait to try this Banana Foster recipe. I love Bananas fried too. Definitely this dish will turn out to be amazing . What a delicious recipe. And as you said, it is a perfect date night recipe for sure. I will try this for me and my husband sometime soon. Wow, I had no idea that bananas Foster was so easy to make. I guess because it has a fancy name, I always thought it would be more complicated! Thanks Amy, I think the flambe is what throws people ;) Hope you love it! I love a good bananas foster, and this recipe looks great! I can't wait to try this! Bananas Foster! My absolute favorite dessert of all time! And those skillets... I NEED those skillets! Great recipe and I will be making this for sure! I'm pretty crazy about it myself ;) Hope you get to make this one! I just yelled out to my hubby, "I just found a delicious banana foster recipe." He answered with a "Yay." Your recipe looks so delicious and easy! I'll be making your banana foster this weekend for sure! Such an amazing dessert! Love that they are made in little cast iron skillets! Bananas Foster is one of my favorite desserts, yet I do not have a good recipe. This one is perfect! Thanks for sharing! yummy! 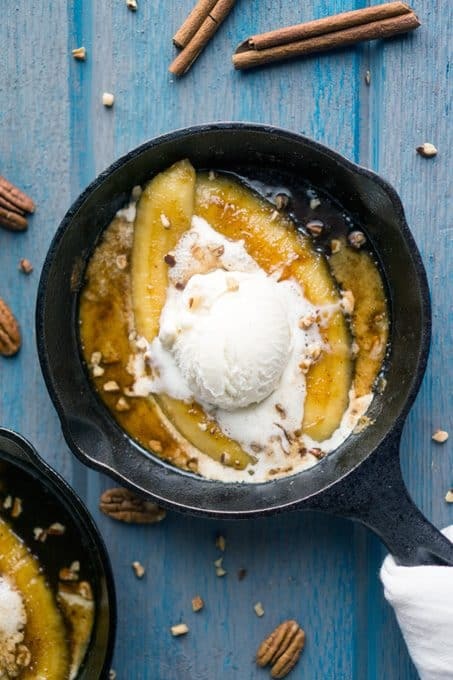 I would love to try this Bananas Foster Mini Skillet Flambé! What a cool recipe. I love anything banana and this looks like an interesting one. I've spent most of my adult life in New Orleans, and one thing I can't ever get over is how delicious - and actually easy! - bananas foster is. Your recipe looks perfect, and it's giving me all the cravings! Also, that orange olive oil cake and chocolate ganache - YUMMY! Well Jeni, this makes my week! I consider it a complete honor to have someone who's done the time in NOLA pay a compliment like that. Thank you...and lucky YOU! I've wanted to live there for many years! Bananas foster always makes me drool but I've never had it in a skillet. I bet it's to die for! Already drooling even by looking at this dessert! I don't have small cast iron skillet, but I think I might be able to double the recipe and make it in my 10-inch skillet. Looks absolutely delicious! Flambé sounds like a lot of fun!! This looks and sounds amazing! 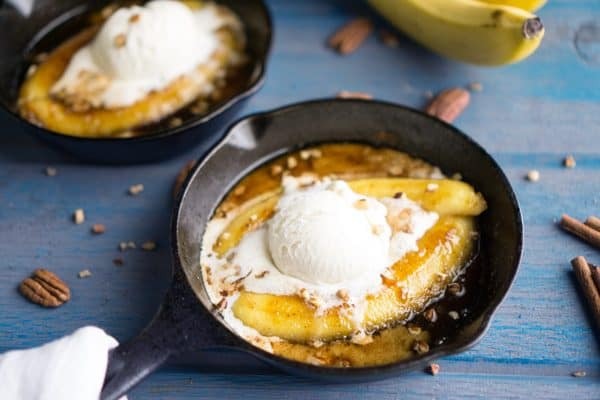 I've never had banana foster, but I do have little skillets so obviously it's meant to be! I'm 100% with you on this! In fact, I think I'm gonna make them again over the weekend...been a while :) Thanks for stopping by! Can we just stop and talk about how much I love this idea!! Cuteness and deliciousness and portion control all rolled into one! Brilliant! You're too sweet! And you totally get me :) Thanks for stopping by and making my day! I swear I could hear my waistline screaming for mercy right now.. this is such a perfect treat. Omgosh, me too! My waistline, my booty, my thighs....all of it! But I throw it all out the window for this one any day :) Thanks for stopping by! an impressive dessert! only 10 minutes, that is a good feature too. Thanks David! It truly looks impressive, but it's so easy. I call this a bachelor's secret weapon :) Thanks for stopping by! Flambe away I say, it always looks so spectacular, a great way to show off and in reality very little danger of spreading fire unless you are super negligent as the flash point of alcohol is so low. Thanks Brian! Ya, the flame is very low...the only way to play it safe in my book :) Thanks for stopping by! This looks like one of those recipes that is worth breaking the rules for. A lovely mix of ingredients to make a real comforting and treat worthy dessert. What could be better than carmelized brown sugar on banana, with smooth icecream. Blissful.